Colossians 4:7-18. This sermon was preached by Pastor Marty Bonner on August 19, 2018. Throughout history it is clear that God uses specific individuals to open doors of ministry and accomplish great things for the Kingdom of God. However, today I hope you will see that even in such cases, no one ministers alone. God expects us to work together so that the work He intends will be accomplished in our area and beyond. Each Christian needs to seek the Lord regarding how we can help in ministering the Gospel to this world, whether that involves leading a new work, or coming alongside someone whom God has filled with a vision for reaching the lost. No matter how small and lacking in talent you may be, God has a place for you in His plan. Starting in verse 7, Paul gives a series of explanations to the Colossians regarding different individuals who were helping him. The first two are those who had delivered this very letter from Paul, who is in Rome under house-arrest, to the Colossians. Such a journey required a lot more help than it would in today’s world. The first individual is Tychicus. He is described as a beloved brother, faithful minister, and fellow servant in the Lord. Paul saw Tychicus as more than a worker who would help him get things done. He had a familial relationship with him that was like a brother. We must never lose sight of this in the work of the Lord. If we treat it as a business and abuse one another in order to get things done, then we have lost sight of what God has called us to. The second individual is named Onesimus and he is described as a faithful and beloved brother as well. Here we are told that Onesimus is “one of you,” which means he is from Colosse. This is the very same run-away slave of the letter to Philemon. Apparently Onesimus had run away from his Christian master, Philemon, and ran into Paul. Onesimus became a Christian through Paul. But, note that Paul does not describe Onesimus as a “run-away slave” here in this letter. He is called a brother in the work of the Lord. In fact, it may be possible that Onesimus had delivered the letter to Philemon at the same time as the letter to the Colossians. Paul points out that the Colossians will be able to hear what was happening with Paul in Rome in order to comfort their hearts. When we are unaware of what is happening to others we love, it is very disconcerting. Thus they would receive comfort by the testimony of Tychicus and Onesimus. These two help Paul in some very practical ways. They helped him stay in contact with the churches by carrying letters on ships and over land. In our modern world of technological wonders we can forget that even our system of communication requires people helping and serving in very practical ways. Not all service to the kingdom looks super spiritual, but it is needed nonetheless. Starting in verse 10 we have three individuals who are described as being part of “the circumcision.” Basically it means that they are Jews. However, the New Testament also describes a group of Jewish Christians who attempted to make Gentile converts to Christ follow the commands of the Law of Moses. Circumcision became a flag for this view. It doesn’t seem likely that these three held this view previously, so it is probably simply a way of referring to their Jewish ancestry and not their theological views. By the way, it has been pointed out in the past that it is curious that there is no mention of Peter being in Rome at all. Those who teach that Peter was the first bishop of Rome have a time explaining this issue. The first of this group is Aristarchus, who is also under house-arrest with Paul. Most of these individuals have come to Paul and are freely helping him. However, Aristarchus is stuck. Though he is Jewish, he was a Macedonian from Thessalonica, who had been helping Paul throughout his missionary journeys. In fact, he was with Paul in Ephesus, when they were arrested for creating a mob. “Great is Diana of the Ephesians!” (Acts 19:28). Thus Aristarchus is a helper who has been with him through thick and thin. Next we have Mark the cousin of Barnabas. If you are not aware, Paul and Mark had some difficult history. Mark, also called John, had abandoned Paul and Barnabas on one of their missionary journeys. Later, when they went out again, Paul refused to let John Mark accompany them. Barnabas disagreed. This led to them going separate ways. (See Acts 13-15, esp. Acts 15:36-40). Several times in his letters, Paul goes out of his way to encourage churches to receive John Mark and not hold his previous failings against him. So here we see that John Mark had traveled to Rome in order to help Paul, and Paul is very appreciative. Christians are always going to have their times of strife. But, we must work in order to make things right and forgive one another. This is a classic picture of such in the early Church. By the way, Mark is the one who wrote the Gospel called by his name. The third Jewish person was a guy named Jesus, or also called Justus. We know nothing about this Justus, other than that he was Jewish and had gone to Rome to help Paul. Perhaps he is a friend of John Mark and came with him. Paul seems to imply that others of “the circumcision” should have been there to help him. I don’t want to read more into this than is appropriate. However, Paul may be thinking of at least two things. First Paul is a Jew and so Jewish Christians naturally should go out of their ways to encourage him. Second of all, Paul was arrested in Jerusalem under false charges. Thus the Christians of Jerusalem should also feel an obligation to encourage him. In all this, Paul praises these three for being a comfort to him. We all need comforted as we work for the Lord. No one is so spiritual as not to need comfort, not even our Lord Jesus. We must allow others to come alongside of us and comfort us. However, God’s supply of helpers in our life is not a steady stream. In the letter of 2 Timothy, Paul notes a time of having no one with him. Ultimately, we must always draw our comfort from the Lord first. In verse 12 Paul quickly mentions some other helpers who want to greet the Colossians. Epaphras is a Colossian and a fellow slave of Christ. Though it is not mentioned here, in the letter to Philemon it is clear that Epaphras was also imprisoned with Paul. Note that Epaphras is praised for his many prayers for the believers in Colosse, Laodicea, and Hierapolis. He prayed “fervently” (the word denotes that pain is involved) for them. Thus just as some help is very practical, so some help is very spiritual, but both are needed and should be commended. Next Luke the doctor is mentioned. He is the author of the Gospel of Luke and the Acts of the Apostles. He was with Paul throughout many of his journeys. In fact, if you read through the book of Acts, you will notice a change at times in the pronouns that are used. Sometimes he writes “we” did this and “we” did that. Then it switches to “he” did this and “he” did that. Paul calls Luke beloved. Perhaps Luke had to use his skills as a doctor time and time again to assist Paul in keeping healthy. Little is said of the last individual Demas, other than that he greets them. It is believed that this is the same Demas of 2 Timothy 4:10 of whom Paul wrote, “Demas has forsaken me, having loved this present world, and has departed for Thessalonica.” The ministry of the Gospel is not always easy and there are always those who will start out strong and then fall away from Christ. We must always keep an eye out and minister to one another so that no one is discouraged. However, the problem with Demas is rooted in his desire for the things of the world. He had been trying to plow with Paul while looking back at what he had left behind. No one can serve two masters for long. Paul asks the Colossian believers to greet the Laodicean believers. He also asks them to greet the individual named Nymphas, and the church that met at his house. House churches were the norm. Thus there is something particular about Nymphas that causes Paul to mention them, as a means of encouragement. In fact, any church leader is always in need of encouragement. Some translations refer to Nymphas as a man and some as a woman. This is because some older manuscripts use a female construction of this sentence. Regardless, the point is not the gender, but the need for encouragement. Beginning in verse 16, Paul gives some final instructions while closing the letter. He tells them to share his letters with the churches around them and to read the letter that he wrote to them. The early church did not have a New Testament. The letters of the different apostles were being written at the time and typically were only known in the areas where they were sent. Yet, over time they would be shared beyond their areas and eventually with all the Church. Here we see the apostle instructing and approving of such. Even though the letters were to a particular people at a particular time, they have value to any believer who would read them. In fact it is here that we read that there had been a letter to the Laodiceans that did not survive this process. It has been lost to the sands of time. In verse 17 Paul gives a particular person a reminder of the duty of ministry. The man is Archippus, who is mentioned in the Philemon letter. There is clearly more to the back story that we are not aware of. Perhaps Archippus had a calling to ministry upon him and he was either not doing it, or being apprehensive in doing it. Regardless Paul encourages him in his duty to minister. Three things about ministry are told to us here. First, we must take heed or pay attention to the ministry that God has given us. Ministry doesn’t just happen. People must pay attention in prayer, in word, and indeed. We must watch out for others and allow God to speak through us in order to share the Gospel, and mature those who receive it. Second, ministry is received from the Lord. It is never “our” ministry except as that which has been delegated to us by the Lord. It is His ministry that we partner with Him in order to do it. Christ opens the doors and supplies the work of the Holy Spirit to make it effective. In ministry we must never get our eyes off of the fact that we do what we do for Christ, not for another person, or for ourselves. Third, Christ expects us to fulfill it. We must be diligent and obey the Lord in order to “fulfill” the ministry that He has given us. We don’t always understand why God sends us to some people and certain places. However, it is our job to be faithful and fulfill the purpose for which He has sent us, and not the purpose we imagine that He has sent us. Lastly, Paul tells them to remember his chains. The chains are real, but are also symbolic of this world’s hatred for Christ and His people. They should never forget that even though they may not be in chains, there are others who are currently imprisoned for the cause of Christ. They should never forget that even when people are no longer in chains in their part of the world, the Gospel was brought forth by those who endured such hostility, and it will indeed come round again. Ministry does not happen without the Lord, but neither does it happen without people saying “yes!” to Him. If we were to write a letter about the people who are helping with the ministry of Abundant Life Christian Fellowship in Everett, WA, or who have ever helped, that would be a long list, and we are a small church. What would be said of you or me? May God help us to be faithful to come alongside the ministry that He is calling us to do. We may not be the leader like Paul was, but we all need each other in order to help the ministry of the Gospel to go to fellow believers and to the lost. This concludes our time in the letter to the Colossians. Colossians 1:15-20. This sermon was preached by Pastor Marty Bonner on May 6, 2018. We have been looking at the book of Colossians. Paul in the verses before this section has focused on how thankful Christians should be. The apex of this is to be thankful that we are in “the Kingdom of the Son of His love.” Though the world of darkness is still around us, believers are part of the Kingdom of Jesus and need not fear the darkness. In verses 15-20, Paul expands on just who this Jesus is for whom he says we should be thankful. What Jesus did for us ultimately hinges upon who He is. Both are important. So who is this Jesus who has redeemed us to God by His blood at the cross (see verse 14)? All kingdoms have a king and Jesus is the King of all believers. However, he is far more than this. The Colossians had been influenced by several different views about Jesus. Some who had a Jewish background saw Jesus as something to be added to the law. Thus they promoted circumcision and the prohibition of certain foods etc. Some, who had a Greek background-especially Gnostic ideologies- had difficulty mentally accepting that Jesus could be both fully God and fully human. Thus you would run various ideas that made Jesus less than the Apostles had taught. Paul here reminds the Colossians just who Jesus is. The first point we run into is that Jesus is the image of the invisible God. This is an important concept because in Genesis we are told that mankind was created in God’s image. We have the ability to reflect attributes of the God who created us. This is different than being God, but is important nonetheless. The fall in the Garden of Eden impacted the ability of people to reflect God’s attributes. The interference of that ancient serpent, the devil, led mankind to experience sin and its death. Since the Garden no human has perfectly reflected God’s image nor even come close. This is compounded by the fact that sin separates us from God. Jesus in his totality is the image of the invisible God in its totality. He is the only way we have to truly understand what the invisible God is like. To see One of them is to have seen the other. Hebrews 1:3 makes this even clearer by saying that Jesus is the “express image” or “the exact imprint” of the Father. For everyone who has ever wanted God to come down out of the heavens and show Himself, God sends Jesus. Jesus doesn’t just look like the Father, but He is the manifestation that the Father has given to us so that we may know exactly what He looks like, how He thinks, and just exactly what His plan is. This is why it is important for us to take the time to find out what God’s Word says about Jesus, not just what people in their wisdom are saying about Him. Sure we need the help of those who are mature in the faith to get insight into the Word. But we can never abdicate our responsibility to find out just who Jesus is for ourselves. Do you want to know what God is like? Take time to read the Bible, but also spiritually ask God to open your eyes to what the Word is saying about just who Jesus is. Thus there is a natural part and a spiritual part that go hand in hand. Next we are told that Jesus is the firstborn of all creation. Some have tried to make this mean that Jesus is part of the creation and is merely the first created thing. To them Jesus is not divine in the sense that He is the same essence of the Father. Rather they would call him divine in the same way that we call angels divine (i.e. that which comes from God). The problem with this is that this is not what the phrase is emphasizing. To call Jesus the firstborn is not a way of removing distinctions between Him and creation, but rather inserting one. If we are talking literally, the firstborn is just as human as his brothers. But this is clearly a metaphorical use. The firstborn is not just another brother. He not only receives a double-portion of the inheritance, but He will be the patriarch when the Father dies. Thus the firstborn is distinct from his younger brothers. To say that Jesus is the firstborn of creation emphasizes His authority and place over all of creation. He is heir to all that belongs to the Father, that is, all of creation. Now the following words go on to make the last point obvious. Notice that the creation, both heavenly and earthly, was created by Jesus. This is made even more explicit in John 1:3. “All things were made through Him [The Word who is Jesus], and without Him nothing was made that was made.” Thus Jesus stands outside of the created order, or all things that were made, as The One through who all created things were made. The logic of these verses makes it impossible to see Jesus as a part of the creation, except for the human form that He took upon Himself at a particular point in time. Thus the firstborn is used to present the man Jesus in a category that is different than all of creation. He is the heir and the one who is Lord over all of creation, even though he looked like a man. In fact in verse 16 three prepositional phrases are used to expound the relationship between Jesus and creation. Creation was created “by Him.” This means He is the active agent of its existence. Next we are told that creation was created “through Him.” This is not to contradict the prior statement, but instead to add to the meaning. Jesus is the means by which God the Father brought all things into existence. Lastly, creation was created “for Him.” The purpose of creation is found in Jesus. All things exist because He has a purpose in bringing them all into existence. It is important for all humans to look to Jesus as their Lord, source of being, and source of purpose. Without Jesus we will continually bump up against the reality of this as we try all manner of our own purposes for living. Verse 17 reminds us that Christ is “before all things.” Before anything existed that has been created, Jesus existed in a relationship with the Father. At this time He did not have a human body, but was as the Father is. This is similar to the functioning of Genesis 1:1. Here we find that before anything was brought into existence, God was already in a state of being. John emphasizes this in his gospel (John 1:1) by referring to Jesus in His pre-creation state as “The Word.” This preexistence of Jesus was hard for the religious leaders of His day to swallow (read John 8). However, to the apostles and those who experienced the powerful words and wonderful acts of Jesus, it was proven in every way and was the only logical explanation (not to imply that they determined this through human reasoning). Verse 17 also says that in Jesus “all things hold together.” The idea is that in Jesus all things have been set in relation to each other. Another way to see this is to look deeper at the word translated here. The word is translated as “consist” in some translations. We can compare the word “consist” with the word “exist.” Existence emphasizes the individual thing has being. It exists. However, consistence or to say that something consists is to emphasize its being in relation to everything around it. Thus even the phrase “all things holds together” falls short of the full spectrum of this word. Our existence and we fit into all the systems of this creation, whether natural or spiritual, are His doing. Verse 18 says that Jesus is the head of the body [or Church]. Body is a reference to the Church being the “body of Christ.” Head refers to the authority, but even more importantly it points to a vital influence that it cannot be without. Jesus isn’t just the head authority of the Church, but just as a body cannot live without connection to a brain, so the Church has no existence without Christ who is its head. Thus the image of the headwaters of a river could be used. The vitality of the Church depends upon its connection to Christ who is our head. He is the source of our relationship to all of creation (including Father God), but also the source of our purpose and function within it. The phrase that “He is the beginning” most likely goes with the next phrase that Jesus is the firstborn from the dead. However it can just be another way of saying He created all things. So let’s deal with this second firstborn phrase. Again, the firstborn is intended to set Jesus apart from all that have died. He alone of all who have died has firstborn status. This is important because typically if the firstborn dies, someone else has to take his place. However, Jesus is such a being that his firstborn status is not overcome by death. Just as He is the firstborn of the living, so He is to those who have died. This is proven in that He is the only one to enter into death and come back by His own power. John 10:18 says, “No one takes it [his life] from Me, but I lay it down of Myself. I have power to lay it down, and I have power to take it again. This command I have received from my Father.” Thus, those who are dead have not “missed out” on Jesus. They are included in His authority and as such will be given the right to one day take up their bodily life again, as He has. In Jesus an emptying of the grave is begun. Throughout history all of humanity has come into being, lived, and then died. This cycle is overcome and brought to an end in Jesus. In fact 1 Corinthians 15:22 uses the phrase that Christ is “the firstfruits of those who have died.” His resurrection is a signal that a greater resurrection is coming and for which we can hope. Verse 19 states that, it is the Father’s pleasure that in Jesus all the fullness dwells. “The Fullness” is a phrase that was used at the time to refer to the totality of divine powers and attributes. This is important for those Greek thinking peoples who had the concept of hybrid beings that were only partially divine. Jesus wasn’t just full of the Holy Spirit, although that is true. He embodies the totality of the divine powers and attributes. Thus He is the source of all that we need and could ever ask for. When one is in right relationship with “The Fullness” then one never needs to worry. The Lord is my shepherd I shall not want. As we end this section, Paul points out that it is through Jesus that all things are reconciled to God. Jesus started the process of reconciling the creation back to The Father. The chaos of individual choices and sin, whether in the heavenly beings or earthly, has put all of creation out of whack and proper order. But the work of Jesus at the cross was the place where this reconciliation process was made possible and began. How about you today? Are you in right relationship with the Father and His Son, Jesus? Has your life been reconciled to God by Christ? Let Jesus become the Lord of your life and He will help you set all things in proper order before the Father as you walk with Him. How can you say “No” to such an amazing savior? Trust Jesus as Lord today! 1 Kings 18:40-46. This sermon was preached by Pastor Marty Bonner on December 17, 2017. Last week we saw how God had honored Elijah’s public display of faith by a miraculous fire from heaven coming down upon his sacrifice. This was all in contrast to the pitiful failure of the prophets of Baal. Today we will look at the fallout of that momentous event and talk about spiritual victory in our own lives. But before we get into that it might help if you familiarize yourself with the geography of this passage. Click here for an online map from a great website called BibleAtlas.org. Pay attention that we are in the northern part of Israel west of the Sea of Galilee. The sacrifice has taken place on Mt. Carmel which is on the left of the map part way down (part of the name has been cut off). 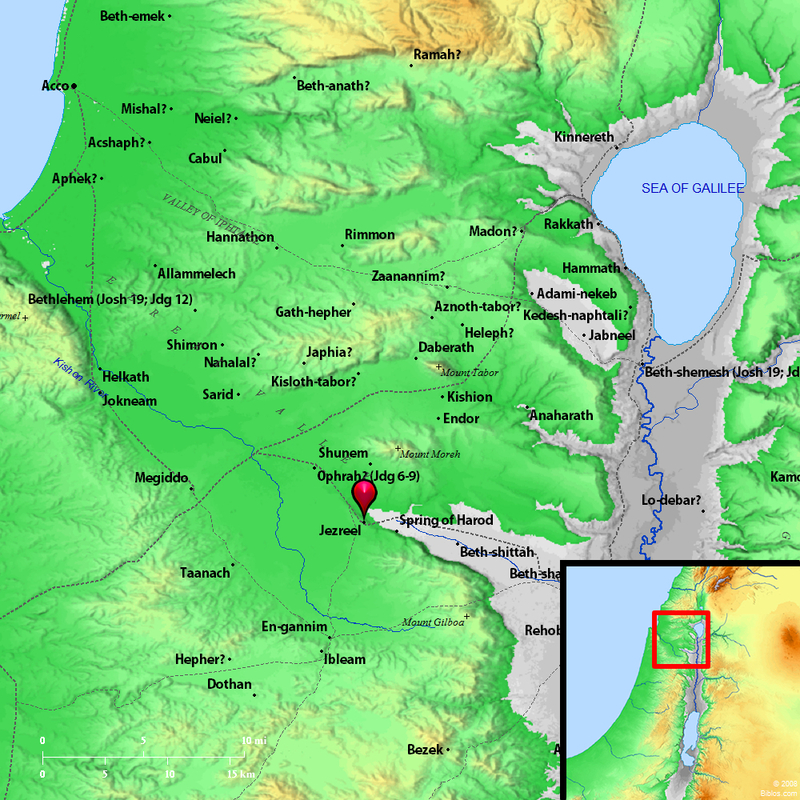 Jezreel is basically in the middle of the map with the Kishon River (thin blue line) flowing from that area past Mt. Carmel and into the Mediterranean Sea (where modern day Haifa sits). When we read verse 40 the passage can be shocking to our modern, western sensibilities. However, I would remind you right up front that we in the West are shocked by things that people in the East are not, and vice versa. Just because it offends us does not mean it is wrong. So try and get over the shock that the prophet of God Elijah orders the people to execute all the prophets of Baal and, instead of tossing God’s Word aside, take time to understand what God wants us to understand here. A big question that often arises from passages such as vs. 40, is that of whether or not Christians are hypocrites when they proclaim peace and yet have such a thing in their “holy book.” If fact, one of our recent presidents, who also claims to be a Christian, chided Christians about eating shellfish when it is forbidden in the Old Testament. Others claim that Christians are hypocrites when they promote love for our fellow man because of passages that speak of the death penalty for sexual perversion. Each of these statements or accusations has a problem in their logic. They assume that the Bible itself, and more importantly God who is its author, teaches that Christians should obey the Old Testament Laws. In fact, the Bible teaches the opposite. You cannot point out one verse and ignore the context of the rest of the Bible and also hold the intellectual high-ground. If we want to deal with the Bible honestly then we must recognize or determine what God’s purpose was in creating Israel as a nation. He created then and made a covenant with them in which they promised to obey The Law that God had given them through Moses. Clearly they did not do such a good job at that, but then we would be casting stones from a glass house. God’s purpose with Israel and The Law of Moses was not to provide a positive template for all the nations of the world. The salvation of the world is not found in converting the whole world over to follow the Law of Moses. The whole purpose of The Law was to shut the mouths of those who claim to be righteous. Israel had divine laws (i.e. better than the wisest minds of mankind could come up with at the same time period). Yet, the people of Israel were not divine and there lies the problem. The Law of Moses failed to save Israel for the same reasons that the Constitution of the United States cannot save us. Nations are run by people who are weak and condemned by the very laws they claim to follow. So let’s look back at this situation. Ahab is completely stunned. Only moments ago, he held all the power. He would execute Elijah when this was over with and he would continue to lead Israel into worshipping Baal rather than the God who had created Israel, Yahweh/Jehovah. Much like a jury nullification of the law, the powerful demonstration of Yahweh’s power nullifies Ahab’s command. The people and even his soldiers have just seen for themselves the power of God. Notice that Ahab does not speak until the next chapter. Even if Ahab would have tried to command for Elijah to be executed, who would have dared to carry it out? Ahab rolled the dice and they came up “snake eyes,” or “dogs” as the ancient Romans used to say. The stakes were Ahab’s life against the lives of the prophets of Baal and they lost. But, Elijah’s command could not come from a truly righteous person could it? We need to understand that Elijah is not some murderous psychopath who loves killing people. The Law that God had given Israel (i.e. their constitution) stated that any prophet who led Israel to worship foreign God’s was guilty of a capital crime. Thus these prophets new they were breaking The Law and committing a capital crime. However, they could care less because they were under the protection of Israel’s Law-breaking king. Ahab had been leading Israel in a direction that was illegal and treasonous. These men have been helping him to commit this treason. If you want to verify this then read Deuteronomy 13, especially verse 5. Several times in Deuteronomy 13, 17, and 18 God declares these things a capital crime. So now that we have exonerated Elijah from the guilt of homicide, we must deal with God. It was His Law. Is it barbaric? Whether or not we agree with such a punishment today, we must agree that this was Israel’s law. Part of understanding why God commands the death of false prophets is to understand the difference between God’s purpose with Israel and God’s purpose with the Church of Jesus Christ. Israel was given the task to bring forth the Messiah or Savior for the world. But, they also modeled to the world the problem with trying to create a perfect society through legislation. All societies have to have laws to function. But, even with divine laws it becomes a bloody business filled with hypocrisy. This is true whether you are looking at the government of Israel or Sidon in the 9th century B.C., or you are looking at the modern governments of The United States of America, Russia, China, Iran, Turkey, et. Al. In the West we keep telling ourselves that if we just make better laws it will fix everything. Yet, things keep getting worse and worse (yes, not everything is getting worse, but hear what I am saying). We have to quit fooling ourselves. Even divine laws, or laws created by an Artificial Intelligence, will fail to fix mankind because our problem is a spiritual one and is deep in each heart. The best we can expect from laws is that they will slow down the evil nature of our hearts and give hope for people to see it and seek God’s help. The only way to change a heart is repentance from our own dead works and turning towards belief in Jesus as Lord and Savior. God’s laws of capital punishment on one hand teach us that some sins are worthy of death. However, the cross teaches us that God does not want to execute us. He is giving us a choice. It is appointed unto a person once to live and then the judgment. Through the Church God is warning the world of a coming judgment or execution. Yet, He is also giving opportunity for people to make peace with Him by putting their faith in Jesus. The Church is not about building a perfect kingdom, but rather, it is about calling people to become citizens who are being perfected by God. Israel focused on a geographical place on earth that required capital punishment to keep it pure, and even that failed. The Church focuses on the spiritual geography of our own heart. Definitely Christians should obey the laws of the nation, as long as it doesn’t break God’s commands. And, we should also work for better laws. But laws are not our hope. The return of Jesus our King is the hope that we hold out to the world. This makes a big difference and makes the Gospel far more potent in light of Israel and The Law. We await the Kingdom of Heaven to be brought down at the Second Coming of Jesus. Until then, we do our best to live at peace with even those who disobey God. Instead of executing those who break God’s command (as God told Israel), Christians speak the truth in love to them, while executing those things within our own heart and mind that would lead us astray from God’s Word. That is why Christians should be restrained in the amount of laws that they promulgate. I spent a lot of time on verse 40 because the contents are important in our day and age. In the rest of this chapter, we see a sharp contrast between the character of Elijah and that of Ahab. Elijah is a wise leader and Ahab is a foolish one. After the execution of the prophets of Baal, Elijah tells Ahab to go eat because of the sound of a great rain. Now it is clear from the passage that there is no sound of rain at the moment. What is Elijah talking about? Elijah is speaking by faith. Even though there is no outward sign, Elijah is confident that God will keep His word. God had told him what would happen and we see him acting and speaking upon that. As I said earlier, Ahab doesn’t speak here. But his administration has been one, big lack of faith in God’s Word. Now it is important to guard our heart, mind and our mouth. We should be careful of our decisions and the way that we speak about things. Am I trusting in God’s Word or doubting it? Out of the abundance of the heart the mouth speaks. However, speaking by faith is not a matter of wish fulfillment, or only speaking “positive things.” Christians should not fall into the error that tries to draw good things to us by acting and speaking positively. Regardless of what you say and do, God is going to do certain things. God is going to judge all the governments of the world in the future through the Second Coming of Christ. It will be a great negative thing to those who are not on His side, but a great positive thing to those on the side of Jesus. Speaking by faith is remembering what God has said and agreeing with it in our speech. In other words we actually believe that God means what He says, and is not a liar. May God help us to speak by faith in His word. Although it is Elijah’s idea, Ahab is a king and can do what he wants. Notice that King Ahab is feeding his belly while Elijah is praying for the rain to come. Ahab is a man of the flesh, not because he eats food. We all eat food and even Elijah ate food. But something powerful and spiritual has just happened in Israel. But one man is praying for God’s will and the other is satisfying the will of his stomach. God’s people can enjoy the physical joys of life within godly boundaries. However, we must not let our lives be only about them. Though God has promised rain, Elijah will not rest until it comes. He goes back up to Mt. Carmel and begins praying for God to fulfill His word. Then we see a cycle of Elijah praying, and asking his servant to check and see if any rain is coming. This goes on seven times until the servant notices a small cloud on the horizon of the Mediterranean Sea. This seven times is intended to highlight that Elijah was not a man who would quit in prayer. He persevered in prayer until God kept His word. He waited upon the Lord completely and kept himself watchful through prayer. We should be the same way concerning the Second Coming of Christ. We should not be apathetic towards what God has said He will do with a kind of que sera, sera attitude (whatever will be, will be). Jesus is not coming back for a people who have an intellectual assent that He will do so, but for those who have desired it and have spent their lives praying and watching for it (like Elijah). When a cloud the size of a man’s hand is seen, then Elijah knows the fulfillment has come. May God help us also to remain faithful even in the day of small things. It may not seem like anything big, but God is in it and rejoices to make it happen. In the end, it is God’s will working with Elijah’s faithfulness that brings rain to the land. Elijah’s speech and life have been lived by faith in what God had said in the past and what He was personally telling Elijah. In contrast, it was the unfaithfulness of Ahab and the people of Israel who followed him that led to the drought and famine, both naturally and spiritually. We must be careful that we do not give up living lives faithful to God and His Word simply because the society around us does not pat us on the back for doing so. Even in the face of active persecution, the hope of our land depends upon Christians living out lives faithful to Jesus. We concern ourselves not with just physical rain and dry land, although that is important to people’s livelihood. We concern ourselves more importantly on spreading the rain of God’s Word into the lives of those who are dry as deserts from years of rejecting or being ignorant of God’s Word. Lastly we see that God’s power is upon those who are humble. The power of God comes upon Elijah as the rain comes and he runs ahead of Ahab’s chariot to Jezreel. Now in our competitive modern minds we would read this as God empowering Elijah to outrun the chariot of Ahab and to be the first to Jezreel. Now this is no small feat. Jezreel was about 10-15 miles away. However, an ancient person reading this would see a servant running ahead of his master. Elijah is running ahead of Ahab’s chariot, like a servant who is letting people know that the king is coming. It is as if God is showing Ahab what could be. God, and His servant Elijah, do not have to be enemies of Ahab. Elijah was not seeking a crown, though he could have tried to take it after such a powerful display. Who wouldn’t want a king who could call down fire from heaven? Instead, Elijah’s run says to Ahab, I will take my place as your servant if you will take your place as God’s servant. May the Lord help Christians today to have such a humility and empowerment from the Lord. Instead of seeking to have the highest place, may we be the influence that those who have it need, to become what God wants them to be. 1 Corinthians 12. This sermon was preached by Pastor Marty Bonner on March 19, 2017. Last week we talked about using our natural gifts to serve God’s people, and so today we will move to the area of spiritual gifts. Though they are very different things, they are intended for the same reason, to help others. Spiritual gifts may sometimes look like natural gifts, but they will always have a lack of natural explanation. Thus, a person with a natural gift of healing has studied and learned through experience what works and what doesn’t. But a person with a spiritual gift of healing simply prays for them. When people are healed through either method, it is clear the source of gift, whether it is natural or spiritual. It is easy to let fear in this area cause us to stay away from it, ignore it, or even reject that it is meant for today. This fear can rise from the fact that spiritual gifts are not generally a part of our everyday experience, whereas natural gifts are. Another issue is that the spiritual gifts have been abused quite often. Thus many people stay away from them because they don’t trust people who are “exercising” a spiritual gift. Many people who are not submitted to Christ have used the guise of a spiritual gift in order to manipulate people and bring glory to themselves. However, in the Bible we are told to be careful in this area. Just because someone seems to be spiritually gifted does not guarantee that they are motivated by God. There are false spirits and false motivations within people. In the Bible they had to be vigilant continually against false teachers, false prophets, and even false-Christs. So, some have felt that this area is so fraught with difficulty and confusion that we would be best to just jettison it from our religious experience. Let me challenge you on that kind of logic. If we quit doing something because someone somewhere abused it, we would be hard pressed to find anything left. In fact many Christians still believe in the gift of teaching even though this is one of the most abused spiritual gifts of all. If they will not quit teaching the Gospel because of the fact that others distort it, then why would they quit seeking spiritual gifts and their use because they are abused by others? The truth is that we need to grow up and approach this with a mature attitude. We must exercise responsibility for our own motivations and the leadership of churches must also exercise responsibility for what they allow and promote as spiritual gifts. Sure it is an area that can be abused, but when we look to the Lord for help, He helps us grow in understanding and discernment in this area. God challenges us to grow up and become more mature, so that the spiritual gifts can operate through us and we can recognize their proper use. Starting in verse 1 we notice that Paul is concerned about ignorance. All teaching is intended to counteract not just the lack of knowledge, but also those things that we have mistakenly accepted as knowledge. For the Corinthians as well as for us, we come to Christ with a lot of cultural ideas and ways of thinking. It is easy to make the Gospel conform to these ideas and “truths” that we think are true. Paul has heard reports about some issues that are happening with spiritual gifts and wants them to understand the truth. In verses 2-3, Paul describes what I would call testing for that which is genuine. The Corinthians had come out of a pagan background full of idol worship, temple prophets and prophetesses, and the oracles of these false gods. The pagan gods had no unifying principle. Their prophecies and spiritual operations were generally cryptic and purposefully misleading. One was left questioning the motivations of the gods and their prophecies. This cultural background was affecting how spiritual gifts were being used in their church. Thus they needed some instructions to help them guard against false spirits and to embrace the Holy Spirit. Paul’s test is simply this question. Does the person promote Jesus as the Lord or not? Both Christ and his apostles had taught that Jesus was the King of all kings and Lord of all lords. He had ultimate authority over all things in heaven and on earth. Thus Paul reveals this as an important test. We could add to this a more general test that Paul gives in Galatians 1:7-8. There the question would be this. Do they contradict the Gospel that has already been given from Jesus and his apostles? In fact Paul goes so far as to say that if he himself were to come back later with a gospel different from what they had already received, then he should be excommunicated. The technical term is to become anathema. Galatians 1:8 says, “But even if we, or an angel from heaven, preach any other gospel to you than what we have preached to you, let him be accursed (anathema).” So what it teaches about Jesus and about the Gospel becomes the test of what spirit is behind a person. The apostle John in 1 John 4 gives these same tests only in different words. There John says that if someone denies that Jesus came in the flesh or is the Son of God, they are of the spirit of antichrist. He goes on to state that those who won’t receive what the apostles were teaching were not of God. So we are given a very clear means of knowing whether someone is of God or not. We check what they teach about Jesus and whether or not they embrace what the apostles taught. This of course describes the New Testament. The Bible itself becomes the means by which we can test the spirit behind any spiritual gift. Spiritual gifts are intended to be motivated and enabled by the Holy Spirit. The enemy loves to promote a knock-off fake of the original. So, each of us need to be motivated by the Holy Spirit. It is the New Testament that helps us to have confidence that we are being led by the right Spirit, as we read it and embrace it. We are all to be truth and error detectors. Starting in verse 4 Paul makes the point that the spiritual gifts are diverse in their expression, but unified in their source, the Holy Spirit. This is important because we should not try to make everybody be the same. No, there is to be a diverse expression of the spiritual gifts that is as diverse as the people God gives them to. Just as the Creator makes a diversity of natural things, so He operates in a diverse manner through the spiritual gifts. Yet, they are always united by their connection to the Holy Spirit. This is an important point. At times churches have descended into a chaos of “dueling prophets” or teachers, each trying to get the majority to come under their influence. This is a sure sign that the Holy Spirit is not behind what is happening. Each claims to have the Spirit of God, all the while, they tear the Church apart. The true spiritual gift will work in harmony with all the others in the body, because it is motivated by the same Spirit that motivates the others. Each of us must be submitted to this truth. God is not trying to raise me up above others, but rather, He is trying to harmonize His work through us all. Thus in verse 7 Paul states what should be obvious by now. The purpose of the spiritual gifts is for the common good of all believers in the Church. The spiritual gifts are given as rewards or badges of honor to individuals to lift them above others. They are not meant to be used to win “the Olympics” of spiritual gifts. This question must always be behind the use of any spiritual gift, “How can this be done for the good of everyone?” When there is turmoil and factions that develop around the use of spiritual gifts, it calls for believers to stop and remind themselves of this truth. Even if the Spirit speaks something to us to share, we should always seek wisdom for “how” and “when” to share. The goal is not to conflict with the other gifts and to promote the good of the whole church. In verses 8-11 we are given 9 examples of spiritual gifts. We know that there are more than nine because later, at the end of the chapter, Paul mentions two other spiritual gifts: the gift of helps, and the gift of administrations. So let’s acknowledge that though these are some pretty big spiritual gifts, they are not meant to be a complete list of all spiritual gifts. The first two are a word of wisdom and a word of knowledge. People who have these gifts will receive wisdom and knowledge from the Holy Spirit. Wisdom has to do with the plan or how to do something. We see this in Acts chapter 15 when the early Church was debating about what to require of the Gentiles who were being saved. The Spirit of God gave them wisdom through certain individuals that led them to refrain from requiring the Gentiles to obey the Law of Moses plus embrace Jesus. A word of knowledge has more to do with information. It often works in conjuction with a gift of prophecy. God will give individuals knowledge of things that there is no natural reason why they would have that knowledge. Next we see the gift of faith, which should not be confused with the faith by which we are saved. In this case we are talking about a spiritual gift in which individuals have great boldness and confidence in their natural and spiritual gifts. God uses them to help encourage and embolden the other believers. Next is the gift of healing. I mentioned this earlier and it hardly needs much explanation. Though we can all pray for healing, some are given a spiritual gift in this area. Though healings would technically be a miracle, Paul lists the spiritual gift of miracles, which is the ability either to predict or direct events that cannot be naturally explained in their coincidence. The gift of prophecy is not only about trying to predict the future. Prophecy simply means to speak on behalf of God. In a general way, all Christians are to speak on behalf of God to the lost of the world. But, within the Church, God speaks to some in order to speak to the whole assembly. These words of prophecy may be about the past, the present or the future. Either way, it is up to the people of the church to discern whether the prophecy is in keeping with the New Testament. Also, it would not be treated as being on par with Scripture. However, we should recognize that if it truly is the Holy Spirit speaking to a person, it will be 100% accurate. The idea that a person can be completely wrong in a prophecy and somehow still have been motivated by the Holy Spirit is a blasphemous thing to say. At the very least, the person has presumed that their own ideas were from the Spirit of God. It takes strong leadership to pull such people aside and caution them. The spiritual gift of discerning of spirits has to do with an ability to recognize the spiritual motivation behind a manifestation of a “spiritual gift.” There is no natural reason for them to question a person’s motivation, but they recognize it by the help of the Holy Spirit. The last two spiritual gifts that Paul points to are speaking in different kinds of languages and the interpretation of such. The Holy Spirit can help people to speak in a language that they have never learned. This may or may not be understood by people present. In fact, some languages may not be of this earth. Either way, in the church assembly they are intended to be interpreted (not translated). Both of these gifts go hand in hand. They can be used by the same person, or with two different people. Now in looking at all of these spiritual gifts, some of them have natural counterparts. But, the emphasis with spiritual gifts is that there is no natural explanation for them. They are powered and enabled by the Holy Spirit. It is important to recognize that these are not things we can take a class on and learn. They are not things that we can hang out with a person who has them and can mentor us. These are given by the Holy Spirit as He desires (vs. 11). There is no place for self-promotion or self-calling with the spiritual gifts, and yet, these very things are often on display. Instead of worrying about what we have or don’t have, we are to be a people of prayer seeking to help one another. In that context we will discover gifting within ourselves. The emphasis is on helping each other, not on having a list of gifts embroidered on our lapel. Now I want to skip to the end of the chapter to recognize how the apostle Paul wraps up this section. In verse 31 Paul tells us to earnestly desire the best gifts, and yet there is a more excellent way. Of course that way is the way of love in chapter 13. This verse has two aspects. The first has to do with desiring the best gifts. As I said at the beginning, some are afraid of spiritual gifts and want to avoid them. However, the apostle tells us to desire them. I would point out that this is both individually and corporately. However, sometimes our desire can be fueled by the wrong reasons. The Corinthians all desired to speak in tongues because they thought that this was the most spiritual gift. In their mentality, it must be the most spiritual because you couldn’t be understood. Yet, Paul would show them that without interpretation this gift does not help the whole Church. It is better to prophecy in a language that is understood than to only speak in tongues without interpretation (we are talking about within a gathering). There misunderstanding of the purpose of the spiritual gifts had caused their gatherings to become a wild and chaotic free for all with everyone speaking in an unintelligible language. His words are not meant to shut it all down, but rather to give it wisdom. This way the true purpose of the gifts and the Spirit who gave them could happen. Now the second part of verse 31 points us to the way of love. There are some who believe that Paul is trying to replace spiritual gifts with love, like it is better than them. However, when you honestly read the opening verses of chapter 13, we see that Paul is still talking about using spiritual gifts. “If I speak with the tongues of angels and have not love…” The Corinthians had become very self focused in their use of the spiritual gifts. The more excellent way is to have our spiritual gifts tempered and directed by the love of God. Spiritual gifts are meant to operate through the love of God. I pray that you will not run from spiritual gifts, but I also pray that you will learn to be wise in what truly is of the Holy Spirit. There is always going to be some immaturity in this area if we are winning people to Christ. We will have our own moments that parallel Paul’s attempts to teach the Corinthians. However, this can be a good thing if we have enough people who are spiritually mature in the use of the spiritual gifts and can help those who are not to grow and learn to serve properly.